Sgt. John Kunkle has been a peace officer since 1985 and is currently the Department’s K9 supervisor and sole Man Trailing Bloodhound Handler. His partner “Hangtown Hank” is a pure blooded, AKC Wellington Bloodhound and has been in service since 2008. The team is available to any requesting agency for locating missing and lost persons as well as evasive fugitives. 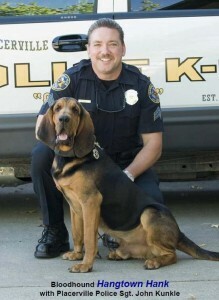 Officer Cannon has been working for the Placerville Police Department for 14 years and a K9 Handler for 5 Years. Sem is a 5 1/2 year old Belgian Malinois imported from the Netherlands in 2008. He is multi-disciplined in criminal apprehenson, narcotics detection and article detection.